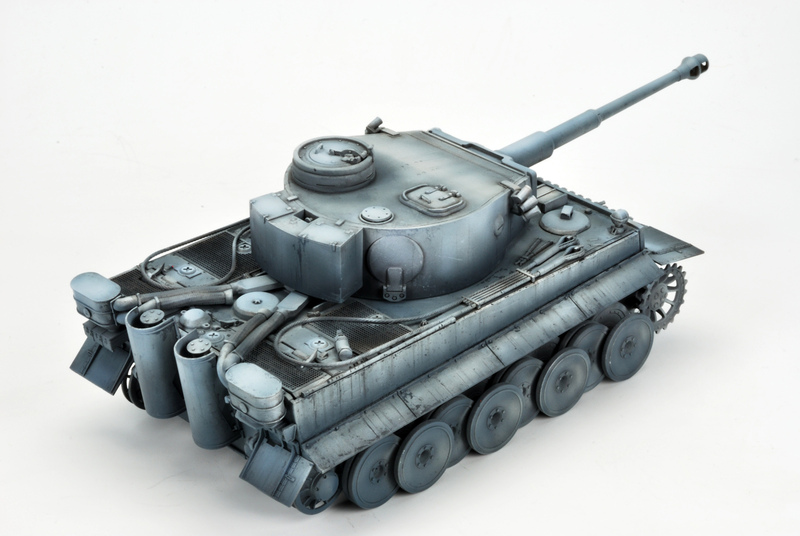 In this step, you can see Gunze´s Metal primer. 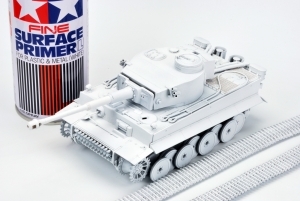 I always apply this primer with a brush over the metal surfaces…. Gun barrel, PE parts …. 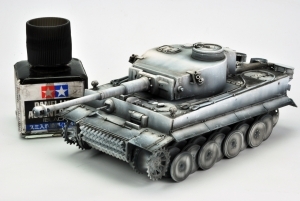 All metal parts are covered with a thick, really thick coat of this product. 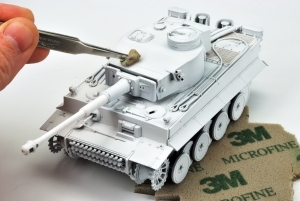 This protects the metal parts from aggressive painting thinners and avoid the paint to peel off. One of the most desperate moments for the modeller is when he discover than the paint over the kit is granulated. People use to hate this, and therefore, the airbrush. There are several variables that helps the enemy to granulate your kit surfaces, lack of moisture in the air, too much dust in the environment, bad paint, bad airbrush… but even in the worst situation, you have a great ally: a fine sand paper. Use it when necessary over granulated surfaces (be careful with PE parts! ), and, very important, the surface must be soft and clean as the skin of a baby!. 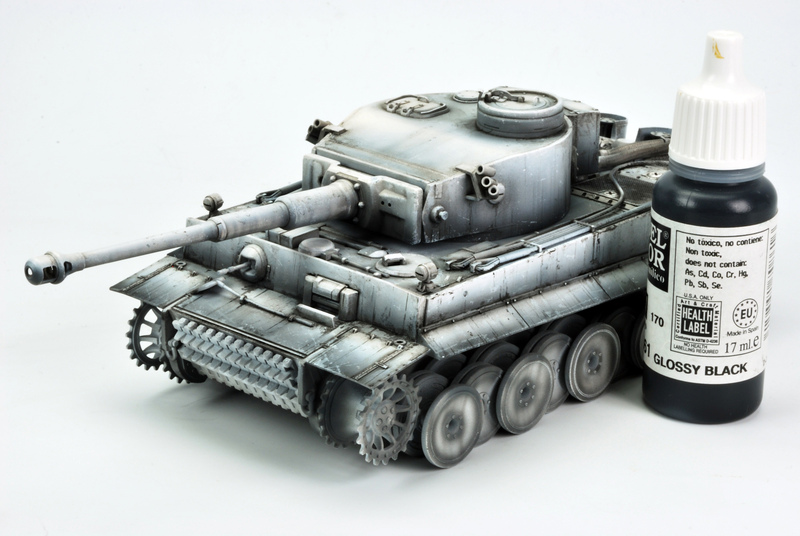 Of course, if you´re making a big tank with rough surfaces … no matter, but a smooth surface prior painting is start playing with advantage! Now, we have to start preparing our Tiger´s skin. Here starts the challenge. Why this technique?. In my case, because I have no a clear idea about colour theory! Most of times, when I want to lighten or darken a colour (dark yellow, for example), the results are anything but harmonics. So, I´ll make the zenithal or modulation effects with a black-grey-white series with no chance of mistake as I just will use black and white colour. Of course, actually you can find a lot of colour sets that makes you life easier (Ammo Mig, Lifecolor…) and I strongly recommend them. But as I use to customize a lot my base colours and I´m a little bit poor (… :^(…), I´ve invented (¿¿??) 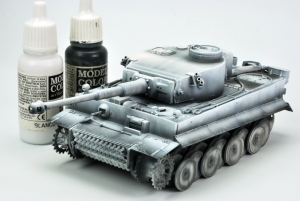 this technique to achieve similar effects just with black and white paint (and the base color). Hope you like it!! General preshading. For me is an important step as I help to to start visualizing the final result. I can discover light effects, have a preliminary idea about the weathering and the most attractive parts of the kit (for painting). With this B&W technique not too much of this step will be seen later (just a little bit, enough to keep the future general looking). I used a 90% black 10% mix applied with my airbrush (I need a new one,,,any suggestions? 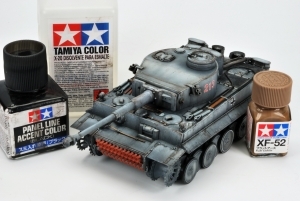 ), using Tamiya acrylic paint thinned with Lacquer Thinner. 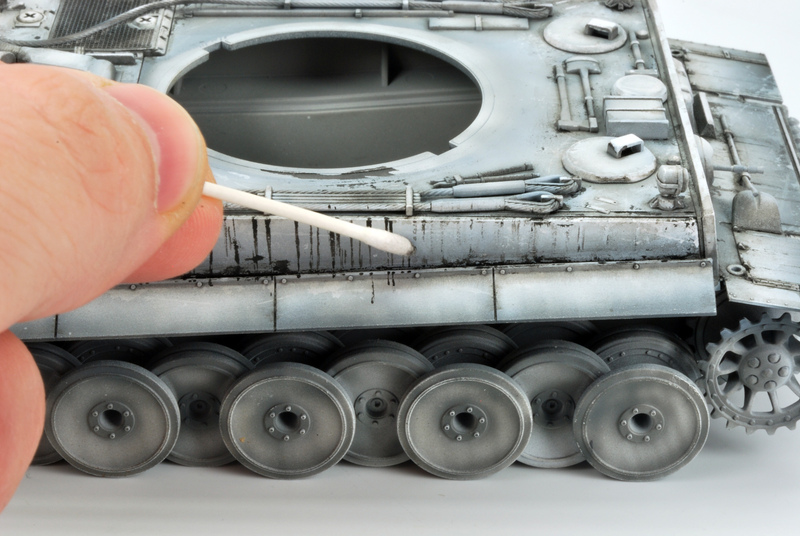 I´ll repeat this hundred times… use your airbrush not like a brush. To pass over a surface do not implies the surface is painted. It´ll be painted may be the 6-7…10 time you pass over it. 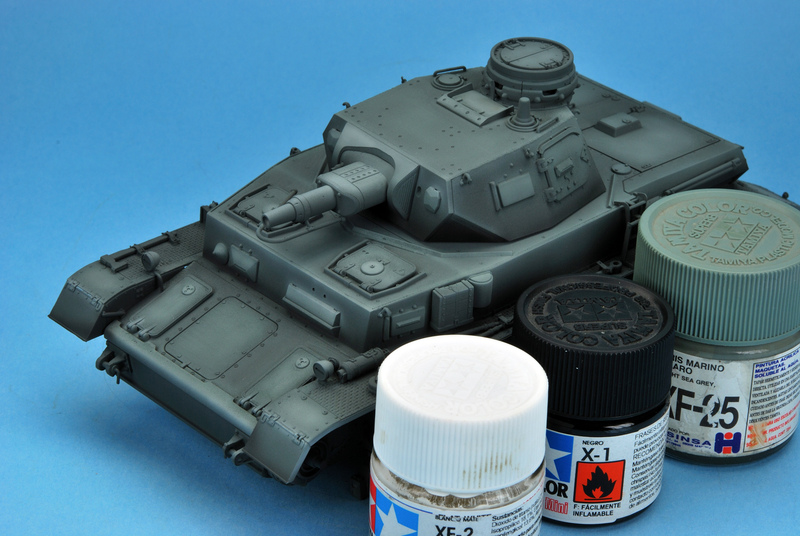 Using first a 80% white and 20% black, I started to paint the general colour of my B&W base, As usually, the paint is heavily thinned as I also want that the preshading work can be seen under this general base colour. Adding each time more white to the mix, I start to play with the modulation and zenithal lights over the vehicle. 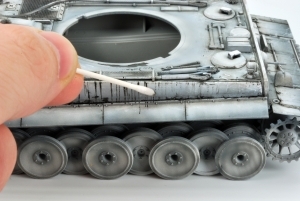 The last step is made using pure white paint. 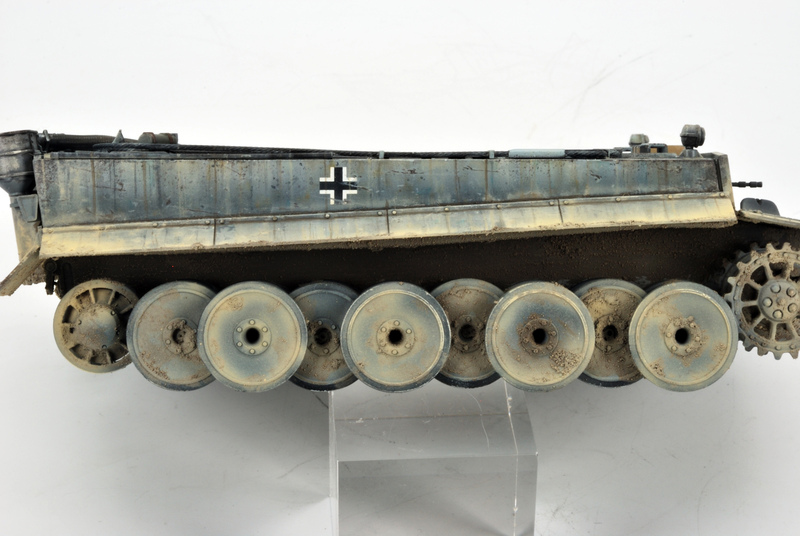 Yes, I know, some skills with airbrush are required, but this preliminary base is a great choice to start taking confidence with one of your best weapons!. Always remember, an airbrush is not a brush. 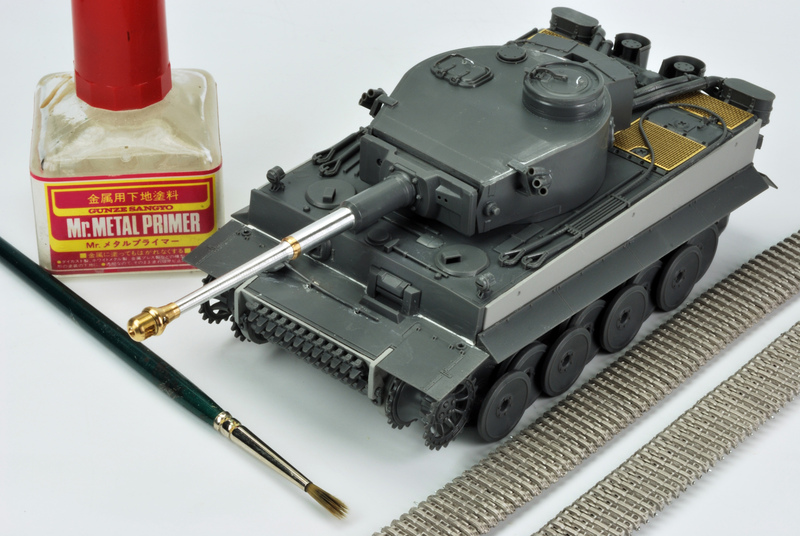 Always thinned paint, move quickly but with precision (the same precision you use to make incredible PE detailing work!). Always try on a piece of paper before painting your model. A nice base coat, even without any kind of modulation or highlights, always takes 2 or 3 sessions. In the first session, the paint should be barely visible. Do it always little by little. 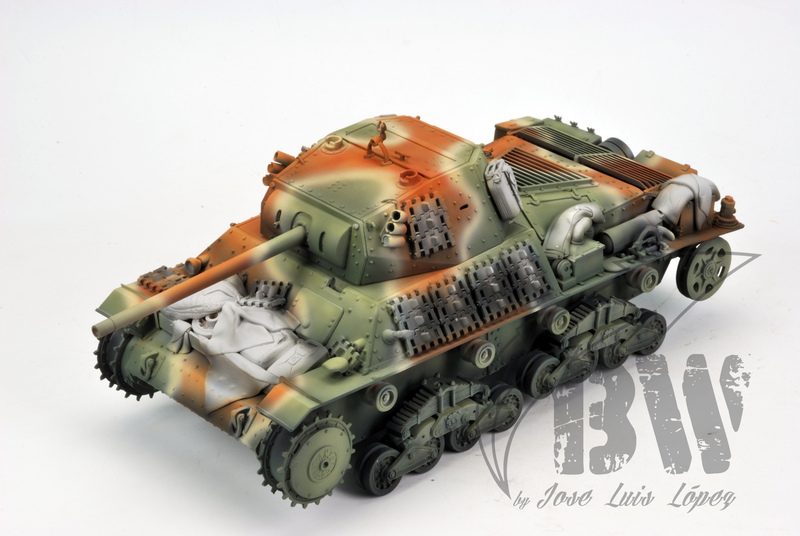 Due to high temperatures here in Madrid and the dry environment, I´ve problems painting. Even with care, some times the paint arrives dry to the surfaces… but remember, your friend the sandpaper is always there, supporting you! Using pure white acrylic paint from Vallejo, with a brush, I just painted some details here and there (clasp, rivets, edges…). I played with the number of coats of paint (one is never enough, like with airbrush) so, not all the details have the same white intensity. I always look for very rich bases, with several colour shades. The result by now looks strange, even the pictures seems rare (the white background does not help! 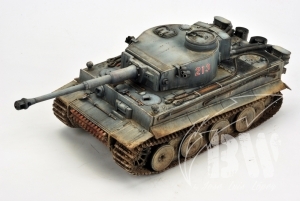 ), but now we have the perfect base for chipping and weathering! Stay tunned! Now, time for chipping. 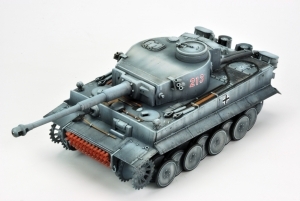 For many modellers, a real nightmare. Actually, it´s a really difficult step, not only making them in the right shape, but also locating them in the correct an reasonable places. And it´s also a tedious work and frustrating at times And many, many many times, a good painted kit is spoiled by a bad chipping work. And there´s no second chance with chippings, unfortunately. And another important factor: How many kits we make in a year? As the average modeller makes 2-3 kits per year, our hands are not always trained to make chipping and scratches. So, when we´re making our chipping work, it was more than 4-5 months the last time we made them. So, we have no habit, no pulse … and the first chips are … awful?. Just when we have been for a pair of hours making chips they start to look nice, just in the moment the work is finished!!. And most times, there are too much chips, or are wrongly situated, or are poorly done. Time to cry. But with this technique, you have two chances, In the first, now, let your hand get warm, do the chips without fear, with confidence, dare to risk with some of them, and, most of all, once you finish this step, stop. Stop. Stop. Look at your kit, investigate it, localize the nice chips, think about the finished tank. And think about keeping the right ones, the places where some are missing, or the places where none is necessary and you´ve already paint several chips. All these are not real problems, as when we paint the base color we can hide or enhance them at our will. 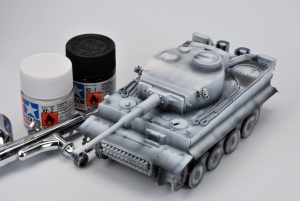 I used Vallejo paints for this step, using pure white for some chips and a light grey for the chips located at the darker parts of the Tiger. General washes all over the tank. I used for this task Panel Line Accent Color from Tamiya, a great product that can be mixed with any of Tamiya´s enamel range and can be thinned with Tamiya´s thinner (blue cap). 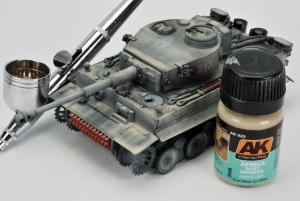 Previously, I added an generous and thick coat of Tamiya´s clear with my airbrush, a completely necessary base for washes and weathering with this tecnique. Also an important step. Here, all the details will become to live, and, something else, a completely no removed wash over a plane surface is a kind of weathering after all!, By now, you ´ll probably locate very attractive parts of your kit, which now is far from looking a toy. 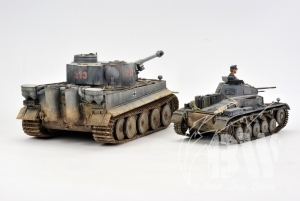 In 1/48 scale, this step is especially relevant due to the lack of detail of these kits comparing them with their 1/35 counterparts. Time for weathering. 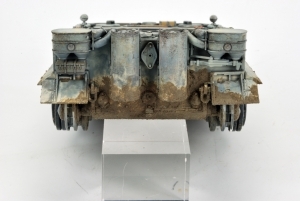 Not a real weathering but a kind of weathering that will help you to create a surface full of contrasts and nice looking for the future base color. Like on chipping task, you have now the perfect choice to risk and dare with the effects in this step. 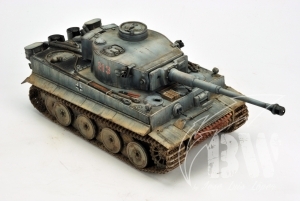 Start thinking about the finished tank and start looking for attractive weathering and colour effects here and there. And do not do it under pressure, just enjoy playing with your brush. Improve your skills… no matter if you fails! For this task I used Vallejo Glossy Black, which suits perfectly to this task. The procedure is simply. Make a spot, a mark, a dirty surface with the paint slightlhy thinned with water. Do not worry, do it in a rude or exquisite way, but do it and experiment your self with the shape of the spots and rain marks or any kind of effect you want. 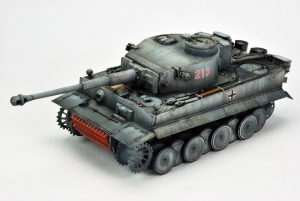 And, again, think about the actual result and the way you want to finish the tank. You have time to change, modify and improve anything you want. And, once again (apologizes if I´m repeating too much), work without pressure during these steps, preparing your hands for the following more demanding steps… do you feel your hand warm and ready? Great!! 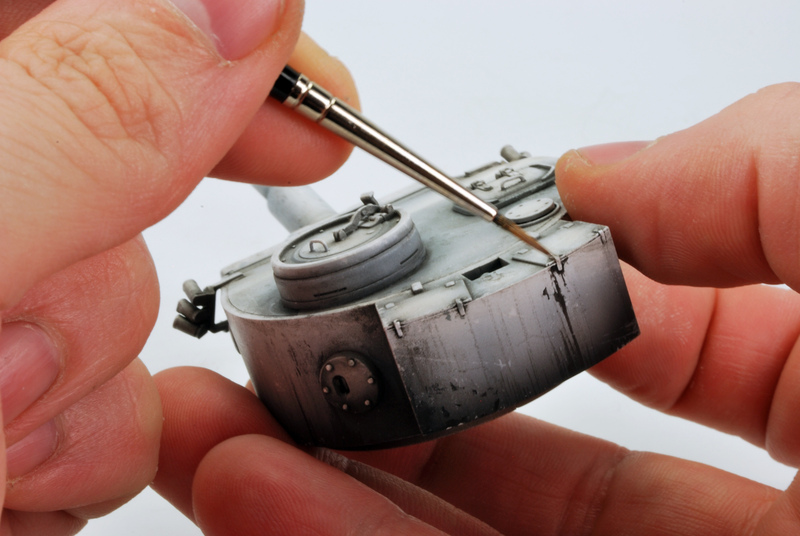 Did you think that you´d wait days to see the base coat? No no no my friends. We have been making all this work just to spend no more than 10 minutes painting the Panzer Grey base color. I just used Tamiya´s XF-63 with a little bit of pure white and I applied this extremely thinned paint mix (90% thinner) in several coats. I insisted with the mix more or less depending the place but, as can be clearly seen in the pictures, all the underneath effects can be clearly seen and look integrated with the base colour. Just at the end, I airbrushed pure white in a few parts to get the maximum light. Very important to airbrush slowly the base coat, no hurries. Just see how it covers little by little the weathered base to your taste. You can hide the awful dirt spots or the illogical and ugly chips. And most important. From this moment, you have a base color that will be really helpful in the following steps as you have a map, a guide to highlight, chip and weather your kit. From now ahead, you have your second chance. Now time to the first base coat for the accessories. Probably, once the vehicle is close to be finish, I´ll change some of the colours according to the general aspect of the vehicle. 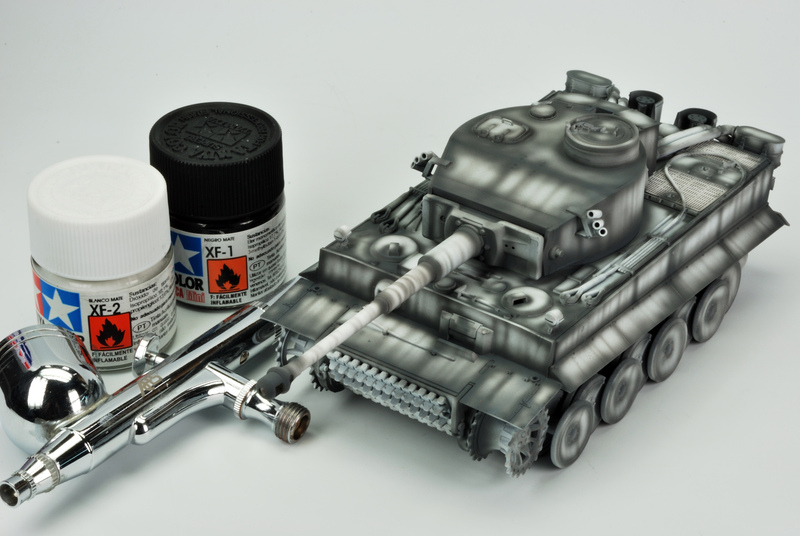 But I like to paint this base coat to the tools, accessories, so on as it really help to evaluate the general contrast and finish of the tank. I used different brown colours for the wooden parts and pure black for the metallic parts. In this step, I´ll add some light points to the tank. Using a light mix of black, white and medium blue (acrylics) and using a brush, I start to highlight rivets, edges, hinges … so on. May be the result in this step is a little bit unrealistic, but it´s the perfect base for future weathering works. 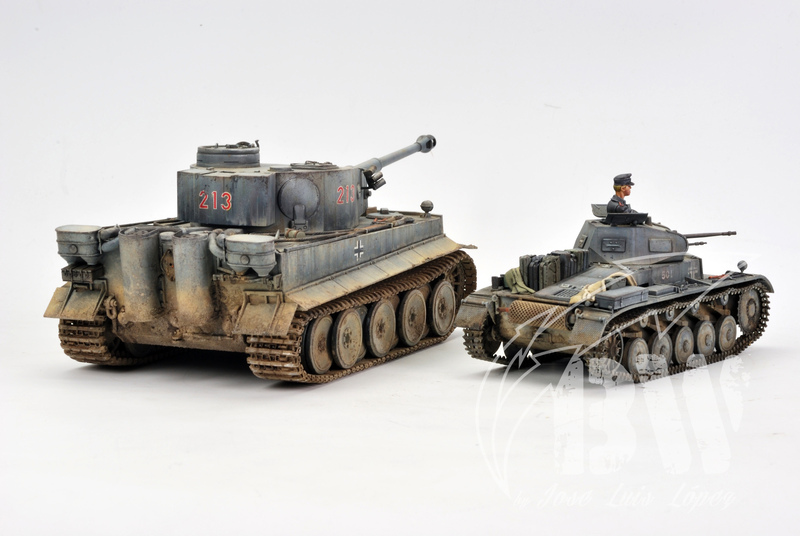 This parts will suffer different treatment that will darken them to my taste, but always maintaining a subtle colour and light difference with the neighbouring tank parts. Is this colour modulation? May be, I do not know, but really works for me! 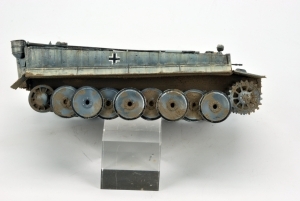 Chipping, like adding mud, are the most frightening steps for modellers. 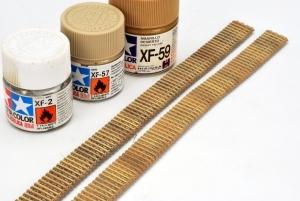 Many great kits with excellent base coats, filters….are spoiled in this step. Reasons are various. The first one is that may be, the last time we made them, was 4 months ago when we made our last tank. Our hand is cold and it´s not easy to get the pulse and the perfect mix of the paint once we´re beginning our work. Thanks God, in this case, may be a pair of weeks ago, or maybe just some days ago, we´ve already made plenty of them in our B&W base color. So, our hand is ready! And now, under the base coat, we see some of the chips and scratches we have already done, so it´s not so terrifying for as, because our terrible enemy, a flat, clean surfaces, is already dirt, showing some chipping effect that we have just to decide if we increase them or not! And as we have seen the B&W weathered step, we already know which chips are right or wrong, So, as I use to say, we do not work under pressure, we know have a ready hand and a clear idea about where to put our chips and scratches. For this step, I made three different grey colours for the superficial chippings. And with a mix of black and red, the deeper ones. 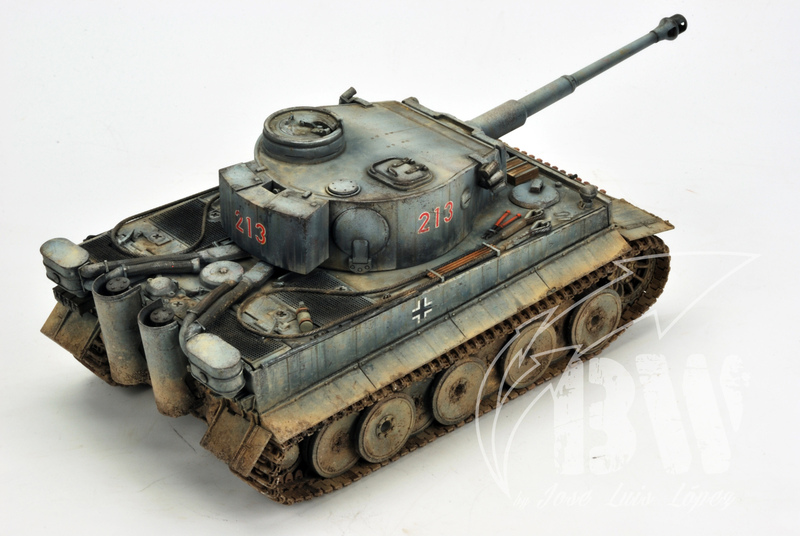 Washes ,,,, they always help to increase the perception of the details of the kit. 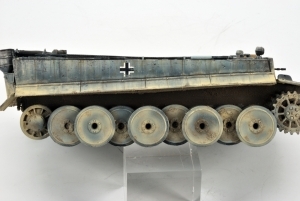 1/48 kits are not as accurate as 1/35 counterparts. And if there were the same quantity of aftermarkets available for the quarter scale, they´d be more difficult to place that in the bigger scale. 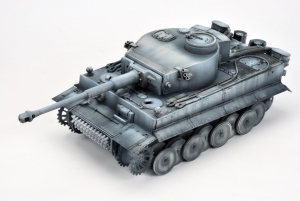 1/35 PE sets are a nightmare by them self … so, in 1/48, for not very skilled modellers like me, are just a Chimera. 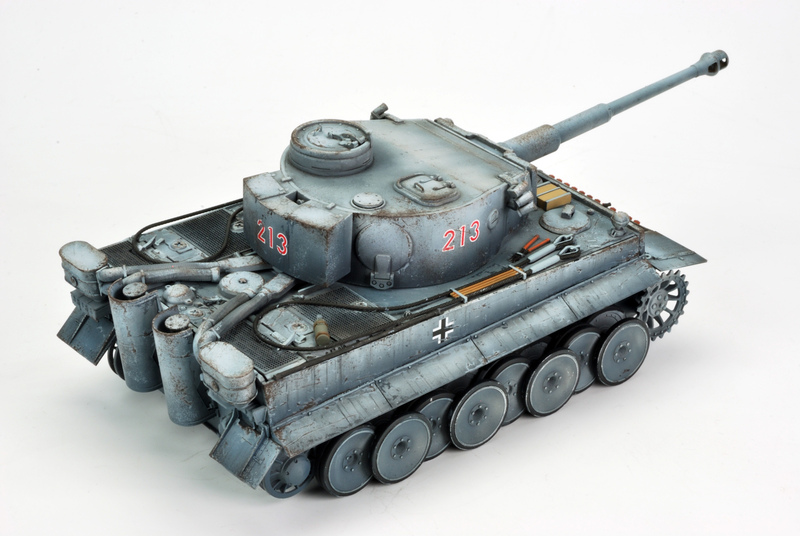 So, in my case, I have to hide this with the paint, showing as much as possible the details available in the kit and bring them to life. For this task, as in the previous steps, I used Tamiya Panel Line Accent color mixed with XF 52 Flat Earth, using Tamiya´s thinner (blue cap) to keep the mix fluid and easy to handle. Oils …. Modellers´s best friend without a doubt!. Easy to handle, slow dry, excellent blur … just perfect! 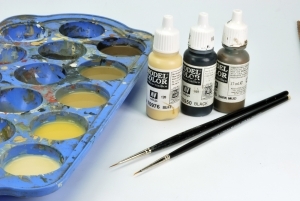 Using different oil colours, Naples Yellow, Van Dyke Brown, natural umber, blue, white, red …. And using the well-know technique of “dots” I faded the grey color trying to reduce the contrast of the different shades of the grey and hiding a little bit the chipping aggressive effect of previous steps. 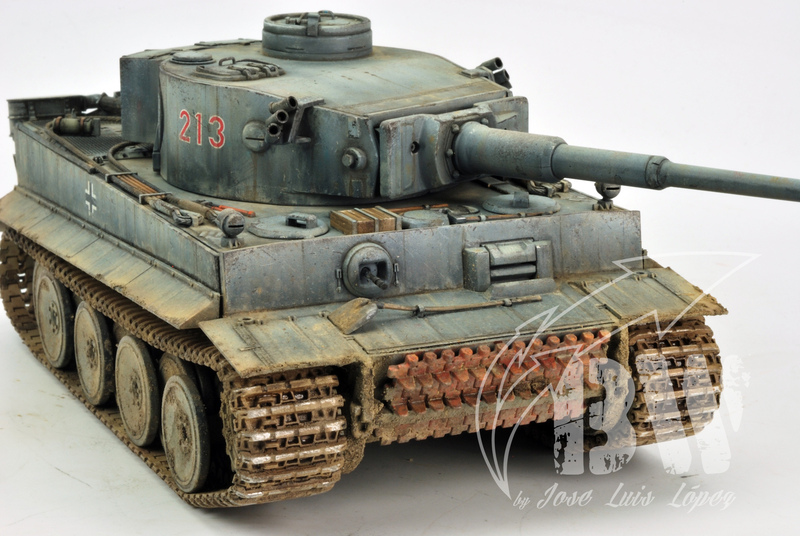 After this step, I´m ready for the real heavy weathering with dust and dirt. Why not to try a new product? In this case, I used AK Interactive´s enamel Africa´s dust (AK22) instead Tamiya´s enamel because I felt that the yellowish dust of this product will suit perfectly to the Kitty. 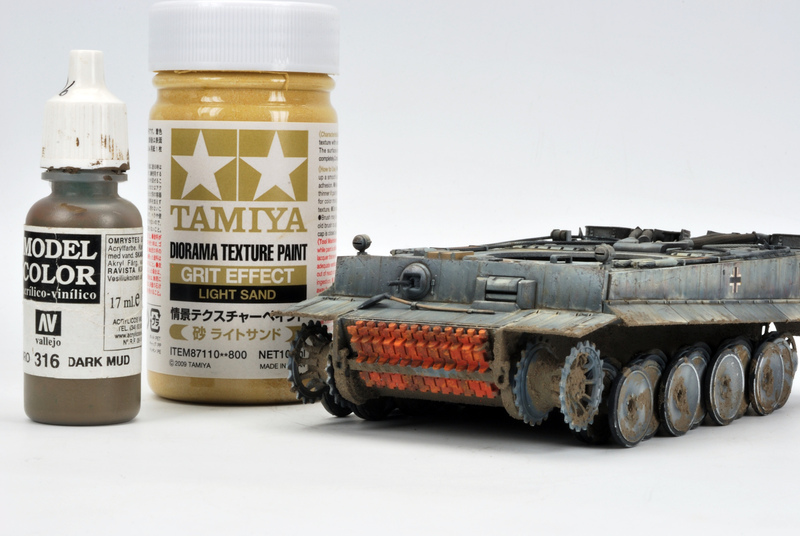 If you have not this product, you can also use Tamiya´s enamel paint to do it using buff, white and a little bit of desert yellow. 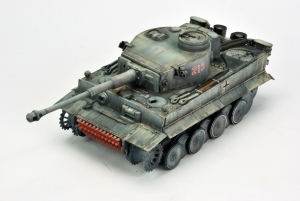 This technique is used by many modellers and the results are really awesome for me. But you must be strong and have faith on your hands, as the intermediate steps of this technique are …. how to say this …. 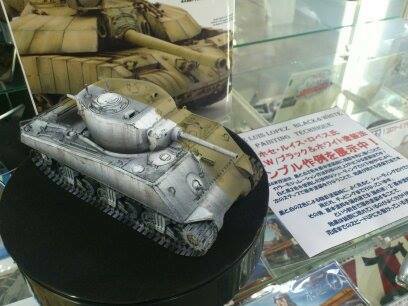 difficult to assimilate if you have not clear the final look of the tank finished. I directly airbrushed the product from the bottle without problems. Now, using AK´s thinner, I started to remove the applied dust to my taste. I just waited 15 minutes and then, using a brush, I cleaned the kit in the desired areas. Even next day I was able to do this because the enamel´s nature of the AK´s product. I must say that I´m happy this the product, easy to apply and easy to remove with a tasty colour for me. What else? 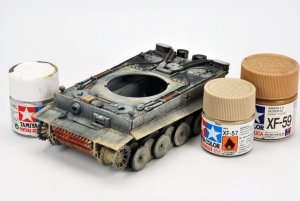 Once the base dust colour shapes are OK for me, I applied a nice coat of matt varnish (Marabu) to seal the dust and to avoid any damage from further steps. Once dry, a pair of days, be patience, I add some dirt details here and there using acrylic paints. I always use the same colours for this: black, dark mud and buff. Mixing them I got a nice dirt colour series. I added water … a lot of water to the mix to ensure that the desired effects are subtle … and if I want a more intense effect, I have just to pass with the brush more times, that ´s all! So, using these colours, I made different contrast in the dust for a more attractive look. Important in this step. The dust on a kit makes it looks … how to say … diffuse, smashed potatoes …. undefined …. Excuse me for my lack of English!. The dust makes all the details to disappear. So, we have to help the kit with some washes here and there. For me, a kit without depth in the details is a fool! I made the washes using the darkest mixes of the acrylic paint. Another daring step where faith is necessary! 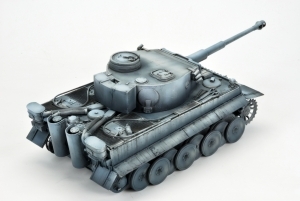 There´re a lot of ways for simulating mud: with plaster, with acrylic resin and pigments, with specific products so on. 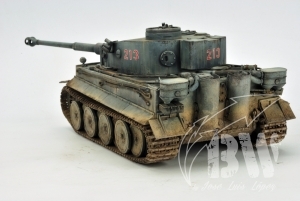 All methods are good ways to achieve an attractive result with the mud, depending on modellers taste or affinity with the materials involved. 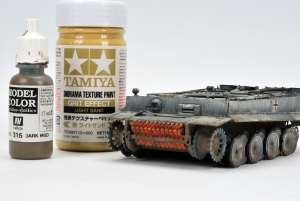 My favorite: Tamiya´s texture paint. Why? A big bottle, can mix it with sand, pigments or acrylic paint and, most of all, fix strongly with any kind of surface. Adding some dark brown pigment and paint to the Tamiya´s paint, I achieve approximately a nice color to start adding the mud. Anyway, the color is NOT important. Just the texture IS important. Must be in scale and as heterogeneous as possible. Using a bush, I applied the mix to my taste to the wheels and the lower part of the tank. As can be seen in the pictures, the result is anything but nice!. But keep the faith! This is just the beginning! 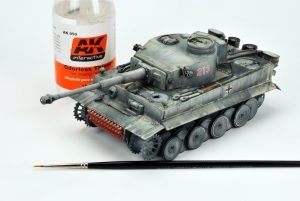 Once the texture paint is dry (a day or more, do not be impatient), using a colour mix of paints similar to the AK´s dust, I randomly applied a fine coat of dust over the wheels. Be sure that this paint do not hide all the elements or you´ll achieve a dull and unattractive surface. As usually, do it as heterogeneous as possible. 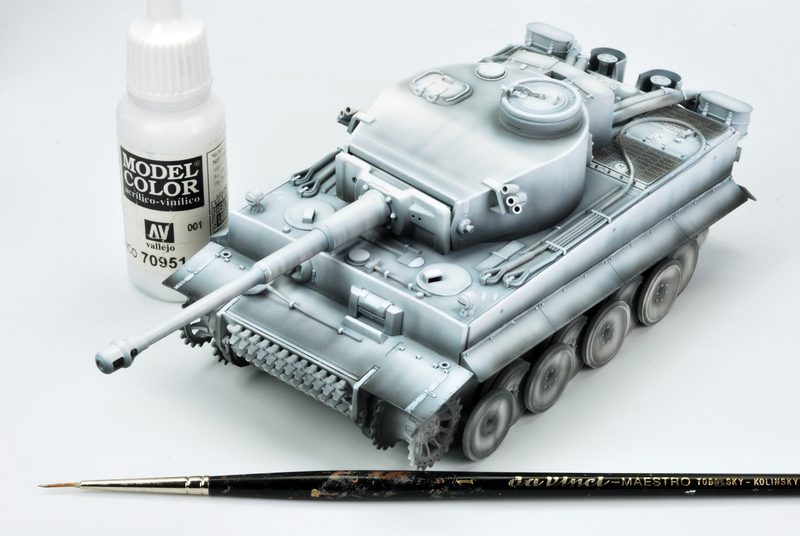 Remember that this paint can´t be removed, so be carefully when applying the paint with your airbrush. And, why not, let´s start with the tracks. Use ALWAYS the same colours for dust in all the parts of the vehicle. Of course you can play a little bit with the mix proportions, but do not use different colours to simulate the same effect: dust and dirt. Using oils: Naples’s Yellow, Natural Umber and Black, I made 3 mixes of this colours (like I did with acrylics) and using them as a wash, I applied them randomly on the different wheels with different intensities. Just in the tracks (where the two previous steps were also applied), I added punctually some pigments (a mix of three colours from Iraqi Sand and Russian earth ) to achieve some textures here and there. 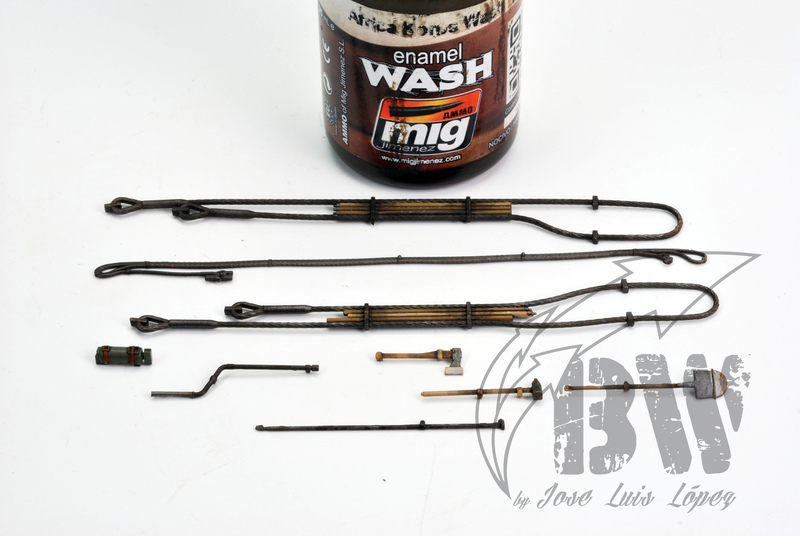 Remember that if you use a lot of pigments, you´ll spoil all the previous work as the surfaces where the pigments are used, if you´re not careful, will get dull, bored and will hide all the previous work! And it´s time to finish the work! 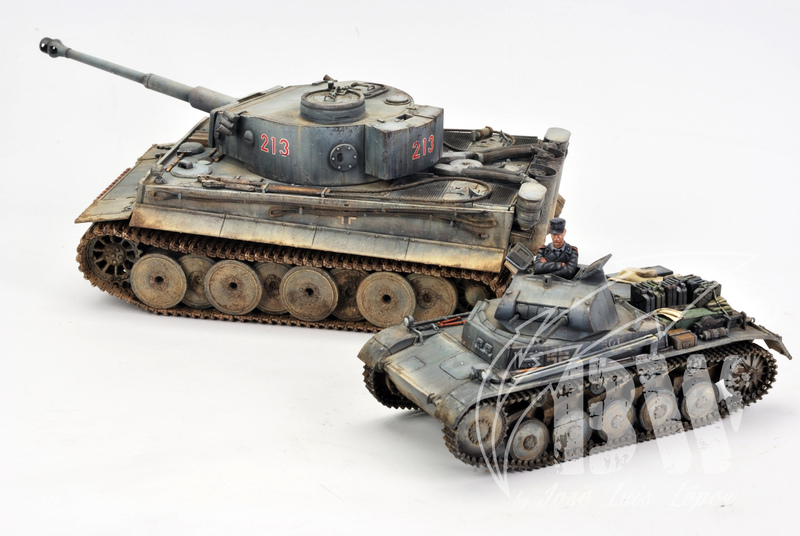 It´s very confusing to really finish a tank, because just at the end we start to make little changes in the kit here and there using all the techniques explained before. Punctual washes, final highlighting, some pigments here and there, splashes on the wheel made with AK´s products (damp earth, mud) and an old brush, polish metal bare metal parts with a pencil (graphite), so on. 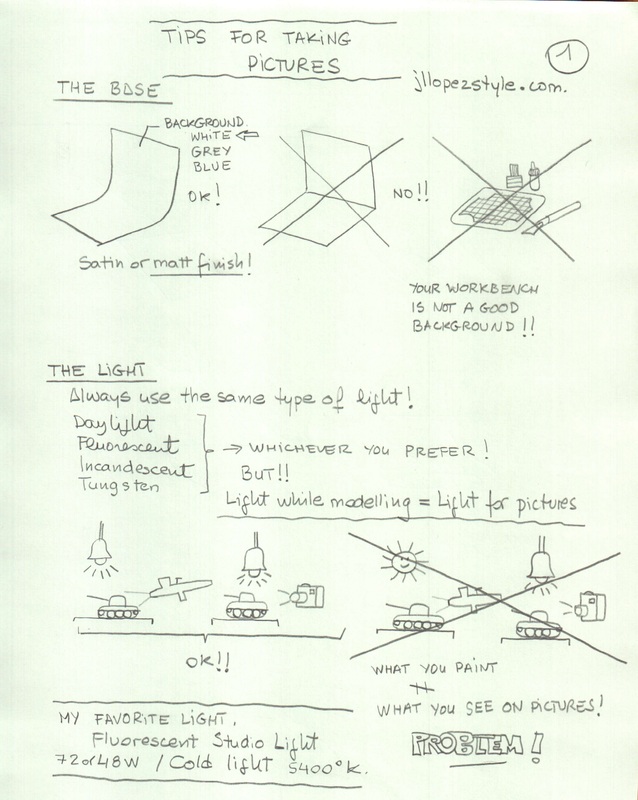 I strongly recommend to work slowly and, as always, have a clear idea about the final look of your kit. It´s the only way to properly use all the techniques explained in this and many other articles. Remember, you must always have a reply once you´re thinking on any technique to two questions: why and what for?